Nov 5th – Funsch Dance Experience’s newest world premiere is truly striking – its composition strikes, its content strikes and its concept strikes. Le grand spectacle de l’effort et de l’artifice hits on all cylinders. Choreographed by Artistic Director Christy Funsch, the five-part dance suite invites its audience to consider form, structure, physical architecture and connective choreographic tissue. While not suggesting a linear narrative, Le grand spectacle de l’effort et de l’artifice also takes a deep dive into conversations around grandeur, display, distillation and simplicity. In addition, with its unique ‘work-within-the-work’ format, the sixty-minute ensemble piece brings together past and present contemporary dance with a special inlay as its third chapter – a rare performance of Daniel Nagrin’s 1965 solo Path. And Le grand spectacle de l’effort et de l’artifice manages to accomplish all of this with a cohesive spirit, clever innovation and captivating performances. Upon entering the theater, one noticed purple and green fabric draped around the deconstructed stage. Two cast members (Yvette Niccolls and Desiree Rogers) sat behind a golden table like judges adjudicating a competition. The setting conjured an arena, an exhibition – a perfect frame for the questions that Funsch was positing. In the center of the space, Funsch and Nol Simonse danced an ever changing duet; at one moment full of sculptural poses, then instantly morphing to highly technical dance phrases and next to recognizable motions and gestures. As the examiner characters and the audience watched, the condition of being ‘on display’ seeped through the room. Contact partnering abounded, with Simonse being the one who was lifted, balanced, supported, carried and as the prelude closed, dragged. And throughout the pas de deux, watching Funsch and Simonse dance together, the viewer couldn’t help be aware that they were in the presence of something extraordinary – these longtime dance collaborators are kindred spirits to say the least. Part I, ARTIFICE brought the quartet of Arletta Anderson, Chinchin Hsu, Courtney Moreno and Karla Quintero into the space to begin the longest of the dance’s five segments. As Niccolls and Rogers continued their scrutinizing gaze, choreographically, a time of extremes unfolded. There were athletic, energetic calisthenics – large, wild runs; scissors jumps, buoyant pony steps. There were mindful, concentrated motions – kinesthetic torso undulations; placed hands, circling, splaying fingers. There were anatomical articulation studies – limbs cycling from straight to attitude, from pointe to flex. And there were oscillating statements of balance, counterbalance and off-balance-ness. But the genius of this section was in the physical vocabulary/dynamics connection. It wasn’t a big=loud and small=quiet relationship – instead, there was a refined, egalitarian swath of physicality, one where every movement equally captured attention and provoked curiosity. After the musicians and the cast had exited the space, Funsch began Nagrin’s Path. Holding a long wooden beam (I’m assuming it was similar in length to what Nagrin originally used, which was twelve feet) parallel to the ground, Funsch, in silence, began to travel along the diagonal from upstage right to downstage left. With defined and determined specificity, she repeated Path’s single footwork phrase (step, step, chaissé into demi-plié in second position, pas de boureé, side step) along this trajectory. All the while the beam remained completely still. Path had no pretense, no extras. It was this choreographic material, in this space, being performed in this moment. And though the solo is very clearly task-driven and goal-oriented, I couldn’t help also feeling a contributing narrative undertone, a sense of pensive soberness filling the stage. The final two segments of Le grand spectacle de l’effort et de l’artifice found the quartet returning to the stage, first with Funsch, and then on their own. And the judge characters also reappeared, except this time, the two women faced each other rather than casting their view on the dance happening in front of them. This difference in posture was key, greatly informing the conclusion of the dance. In this final section, titled Part II, EFFORT, Anderson, Hsu, Moreno and Quintero rediscovered their physicality in the space. But it felt very different from their first quartet – raw, sumptuous, visceral and increasingly tactile. Like there had been a shift from the external view to the internal impulse, and perhaps a freeing from some expectations, constraints or rules. And I cannot close this discussion without mentioning the brainy and astute device that Funsch injected into Le grand spectacle de l’effort et de l’artifice. At various moments throughout the work, the cast broke the fourth wall. Sometimes the lights came up, sometimes they engaged directly with audience members, sometimes both. What better way to pose questions of display than by examining and dismantling the conventional audience/performer relationship, even if just for a brief instant. Nov 29th – DanceFAR’s (Dance For A Reason) annual fall gala never disappoints. Co-founded by Margaret Karl, Garen Scribner and James Sofranko, it has been a shining star in the San Francisco dance season for the past four years and 2016’s edition (the fifth anniversary) was no exception. Each year DanceFAR hosts a diverse group of local and visiting dance artists in an evening-length concert benefitting the Cancer Prevention Institute of California (CPIC). And aptly, this year the gala was held on Giving Tuesday. Outstanding performances with an authentic sentiment and genuine spirit of giving back – this is DanceFAR. Duets dominated both halves of the program, each delivering a distinct perspective on physicality and movement in space. Erin Yarbrough-Powell and Ben Needham Wood of Smuin opened the night with a stirring pas de deux from Stanton Welch’s Indigo. Toggling between luxurious flowy movements and staccato pulses, this brief excerpt left you wanting more. And the ending lift was spectacular – Yarbrough-Powell in a seated position, balanced high above Needham Wood’s head. Specified directional shifts reigned supreme in Robert Moses’ This State of Annihilation, danced by Norma Fong and Crystaldawn Bell Galante of Robert Moses’ KIN. Half unison, half partnering/soloing, this unique take on contemporary technique blended second position, arabesque and passé with intense traveling sequences, including chaînés on the diagonal, pas de basques and even some soft shoe time-step footwork. Next, Jermaine Spivey and Spenser Theberge took the stage in an excerpt from their Rather This, Then, an essay on articulation, physical possibility and in-the-moment interaction. Billed in the program as a ‘structured improvisation,’ I was so curious whether there was any set phrase material or perhaps key prompts informing this captivating work. ODC/Dance brought a portion of Kate Weare’s Giant, one of the three ensemble offerings on the program. Mechanized patterns and lush undulating meet in this dance, as does a strong statement of control and power dynamics. Several points throughout the piece saw one dancer orchestrating and shaping the movements of another. Julia Adam’s tortured duet Grandma and the Wolfie followed, performed by Travis Bradley and Virginia Pilgrim Ramey. While compelling for its technical accomplishments, it was the form of this duet that really struck. It began almost like a solo for Pilgrim Ramey with Bradley traversing the perimeter of the stage around her. And then later, much of the initial phrase material recurred, but this time, partnered. A very interesting structural approach indeed. An audience-favorite from last year, Art of Teknique was back with another phenomenal freestyle program of physical poetry. And dawsondancesf closed DanceFAR’s first half with an excerpt from Gregory Dawson’s Gestures and Angels, a contemporary ballet full of passion, ferocity, speed and level changes. The second half of DanceFAR 2016 began with a dance of storytelling, an excerpt of Tristesse by Marcelo Gomes. 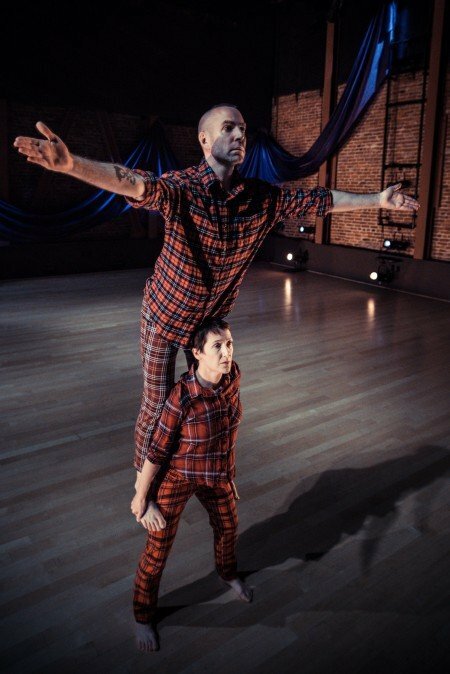 Gomes and Sterling Baca took turns expressing their reality through movement as the other sat ‘listening’ intently downstage right. Baca’s part of the conversation was peppered with suspension and release while Gomes’ was humorous and playful, and even had a little West Side Story snapping built in. Flying Under the Radar premiered @_FUTR_, a highly technical contemporary duet with costumes that reminded of Alwin Nikolais. Sofranko’s SFDanceworks presented the world premiere of Danielle Rowe’s For Pixie, expertly interpreted by Brett Conway and Laura O’Malley. Here was a snapshot of a couple; a glimpse into their relationship. The partnering had such a wonderful forward motion to it, entwining these two souls for this one moment in time. An emotively rich duet was proffered by Alivia Schaffer and Dwayne Schueneman of AXIS Dance Company in Judith Smith’s In Defense of Regret. Schaffer and Schueneman spent the majority of the duet near each other, but separated. When they finally grasped hands and circled each other, it was pure and poignant. Sofiane Sylve and Carlo Di Lanno of San Francisco Ballet danced the Diamonds Pas de Deux from George Balanchine’s Jewels, an elegant, regal and grand expression of technical brilliance and beauty. And while the piece does not seek to tell a story, there is a narrative fiber hidden deep in the choreography. As the dancers float, glide and move about the space, there is a subtle elusiveness at play, like they are trying to actually catch the sparkle and glimmer of a diamond. DanceFAR 2016 concluded with an excerpt from Garrett + Moulton Productions’ summer premiere, Speak, Angels by Janice Garrett and Charles Moulton. In an expression of constant motion, six soloists and a movement choir of eighteen embodied the joy, intensity and fervor that is choreography and community. A perfect ending to a glorious night.